DTK-1F Single Outlet Surge Protector DITEK singe outlet surge protectors provide strong surge protection at a reasonable cost. The unique center screw design that secures the surge protector and, if installed, a transformer, to the wall, prevents accidental disconnections. Models are available to protect power, coaxial and telephone lines. 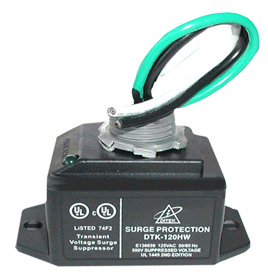 Alarm System Power Surge Protector Single Outlet w/in/out Terminals (for Burglar Panels - X10 Compatible) DITEK's "31x" series of surge protectors are designed and built for professional alarm panels. The 1F31X protects the power and telephone line and has a center screw to secure the transformer to the surge protector and the receptacle.